Smash Ball artwork from Ultimate. The Smash Ball (スマッシュボール, Smash Ball) is an item in Super Smash Bros. Brawl, Super Smash Bros. 4, and Super Smash Bros. Ultimate. It allows the user to activate a powerful Final Smash attack when it breaks. It only appears in Training Mode, certain Events, standard and Special Smashs, not the main one-player/co-op modes such as The Subspace Emissary. Mii Brawler's Final Smash in standby mode after breaking the Smash Ball. When a Smash Ball appears, the screen blinks and the crowd gasps, at which point the Smash Ball will begin to roam around the stage freely. To use the Smash Ball, one must first break it by attacking it; any assistants such as Poké Ball Pokémon and Assist Trophies can help break the Smash Ball for the character who summoned them. A 'fresh' Smash Ball can take around 43% damage. When a player successfully breaks one, the screen darkens, and the player whose attack broke the Smash Ball goes into 'standby mode', in which the character's eyes turn yellow and their body begins to glow a rainbow color. In SSB4 and Ultimate, an additional aesthetic occurs where the entire screen fades into a deep grey color and causes everything to look dark except the player with the Final Smash, who glows with the Smash Ball's colors. The Final Smash can then be unleashed at any time by pressing the input for a neutral special move. Players can attack a fighter in standby mode to make them "drop" the Smash Ball, at which point it will begin roaming the stage again. After using a Final Smash, the character is no longer in standby mode and must break another Smash Ball to use a Final Smash again. When the attack ends, the terrain will also go back to its standard colors. If no one breaks the Smash Ball after a long enough period of time, it flies away and is lost. However, the longer it is flying around, the easier it is to break. It can also be lost if broken by something not attributed to a fighter, including stage hazards (for example, Norfair's lava) and certain items (such as the later parts of a Smart Bomb explosion). Smash Balls are also affected by glancing blows; the Smash Ball will not take damage but will be pushed away. While a character is in standby mode, no Smash Balls will appear until the Final Smash is used (or the Smash Ball is dropped), meaning that only one Final Smash can be used at a time. The apparent physics of the Smash Ball tend to vary. While it will often bounce off of walls and hard platforms, it will occasionally pass through them. The amount of knockback it takes also varies; sometimes, it will take an attack without even changing its trajectory, and other times an attack will send it halfway across a stage or even outside of the visible boundaries. Like with characters, the camera will be pulled out so the Smash Ball stays visible, so a Smash Ball sent off the screen can pull the camera away from the characters. Smash Balls do not vanish by being forced off the stage; however, it may take a while before it roams back to the stage, and it may wander across the boundary for an extended period of time without returning to the stage and then vanish. In matches with a Final Smash Meter, Smash Balls can still appear if they are switched on. Breaking one under these circumstances will instantly fill a fighter's meter. However, there is a downside: the Smash Ball can still be knocked out of the player by opponents, and if this happens the meter will empty completely, rather than returning to its previous charge. Smash Ball artwork from Brawl, though it looks different during actual gameplay. 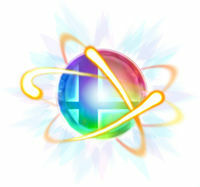 The Smash Ball takes the form of a floating Super Smash Bros. logo that cycles through different colors of the rainbow, and is surrounded by an aura of colorful light. In Super Smash Bros. 4, the Smash Ball also leaves a trail of color behind it, and the aura of light is much more intense. This item is also available as a trophy, with random availability. It is a fairly common trophy to collect. The Smash Ball trophy in Brawl. A mighty item. Each character has a unique secret technique known as a Final Smash that can only be used when that character acquires a Smash Ball. Use it well, and you'll be one huge step closer to victory. It can turn the battle's tide, help you put the finishing touches on a complete thrashing, or even provide a chaotic finish that's sure to leave you laughing until you cry. The Smash Ball trophy in Smash for 3DS. The Smash Ball trophy in Smash for Wii U. This item can truly turn the tide of battle. Once broken open, a character's Final Smash will be unlocked. If your opponent collects this, you'd better brace yourself for a powerful move. This item is pretty durable and floats around the stage, so timing and positioning are key. A special item that lets one lucky fighter unleash their Final Smash, a secret move unique to them. Though it's a one-off opportunity that won't come around very often, this ultra-powerful attack could prove the key to victory! Smash Balls take a few hits to crack, so good timing and placement are absolutely essential. A fray over the Smash Ball in Brawl. The Smash Ball in Super Smash Bros. for Nintendo 3DS. The Smash Ball in Super Smash Bros. for Wii U. A fray over the Smash Ball in Smash 4. When Jigglypuff is using its deflating (down) taunt when it has the Smash Ball, a glowing ball of energy will appear. This is the Smash Ball's form inside the character that broke it. This can also be slightly seen in Meta Knight's up taunt. In the Iwata Asks interview for Super Smash Bros. Brawl, Masahiro Sakurai stated that he had intended to add Final Smashes since the first game in the series; in the debug menu of the first game, unused sound bites of characters can be found that were likely meant for these attacks, such as Ness shouting PK Starstorm. In the Smash Bros. DOJO! !, the Smash Ball does not appear as an item, instead as a "how-to-play" tutorial segment. However, the Smash Ball is included within the Item Encyclopedia sub-section. If all three Dragoon Parts are in play, a Smash Ball will not appear until the Dragoon has been summoned. If a Smash Ball is in play, a third Dragoon Part will also not appear (one or two Parts may appear, but a third Part will not). This is to prevent the Dragoon and a Final Smash from appearing on the screen at the same time (doing so could cause a Dragoon and Snake's Grenade Launcher to have targeting sights on the screen at the same time). The same applies to Mr. Resetti. Similarly, in Training Mode, if a Dragoon Part is spawned while a Smash Ball is on the field, the Smash Ball will disappear. If a Smash Ball is spawned, any Dragoon Parts on the field that are not currently being held will disappear. Some Final Smashes take longer to load from the disc than others. If a character's Final Smash is not yet loaded and the player tries to activate it, they will instead perform their neutral special move as usual. On Yoshi's Island, as it moves about, the Smash Ball can "hit" the yellow blocks and cause them to spin just as a jump from below or an attack would. The Smash Ball, along with the Poké Ball, cannot be swallowed or eaten by Munchlax. In a Stamina Match, if a character is defeated in standby mode, the rainbow effect stays on the body and the screen remains dark until the body is knocked off of the stage. In SSB4's Training mode, the Smash Ball is much weaker, taking around one hit before breaking. In SSB4, the Smash Ball's lines are pure black both in-game for SSB3DS and SSB Wii U and on SSB3DS's trophy, but are rainbow on SSB Wii U's trophy. If a Smash Taunt is happening, and a Pokémon, Assist Trophy, foe, or stage effect destroys the Smash Ball, the Smash Taunt will stop automatically. In Smash 4, Pikmin can latch onto a Smash Ball. When viewing its trophy in the gallery or camera mode, the cross will never move; only the color and trophy base can be rotated. This page was last edited on April 19, 2019, at 15:50.